About this time of year, I start to feel a bit of angst. All of this celebratin’ puts a cramp in the forward movement of my art. I want to enjoy working on mindless projects. I want to have fun decorating and celebrating. But I also want to keep working on my art. And then I usually give in and work on the fun mindless projects, and I realize its only a few weeks. My art won’t just disappear in three weeks time. And its such a relief. I was discussing this with my BF, and she came up with that brilliant statement, “Even artists need a holiday.” I need to have that tattooed on my forehead, because evidently I can’t remember it from year to year. 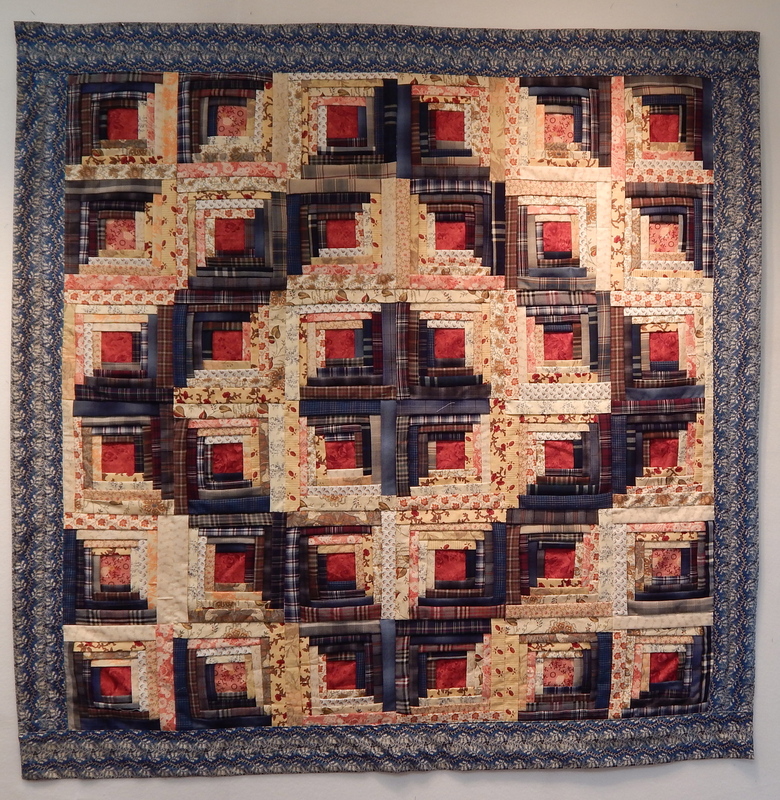 Anyway, the first thing that I worked on was this quilt that I started a couple of years ago, when I took a class from Pepper Cory on the “Manx Roof Tile Quilt,” a type of folded log cabin. (And I just want to say that if you are interested in learning this technique, Pepper was an EXCELLENT teacher!) I wanted to use my dad’s pendleton shirts to make a memory quilt. 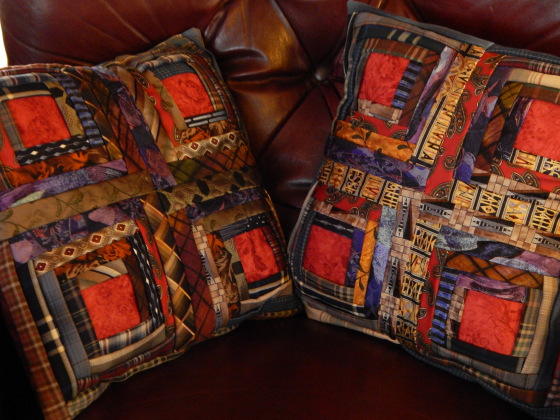 You might remember that last year I used his shirts and ties to make pillows for my brother and sister. 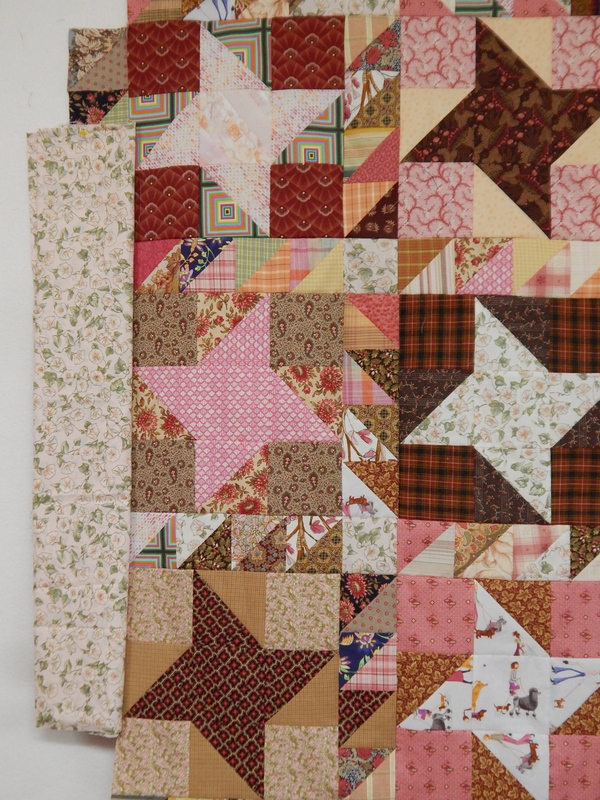 My quilt project got put away when construction on the new studio began, and I just found the box of blocks a few weeks ago. Like most handwork, once you get into the rhythm of it, it moves along quite quickly. I began to think that if I could do one block each evening, I could finish it before Christmas. I didn’t do one EVERY evening, but I did work consistently on them, and when it looked like I could complete the blocks, it got quite exciting! 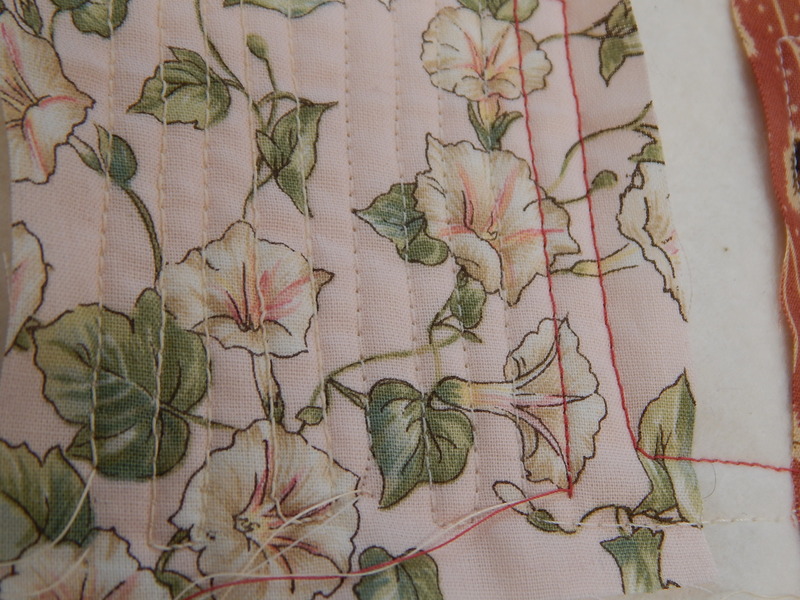 I wanted to make a border by adding an extra large “binding.” Looked in my stash, and there it was–one of my most favorite “repeater” fabrics. Repeater fabrics are those fabrics that I love so much that I just keep buying a yard or two every time I see it. 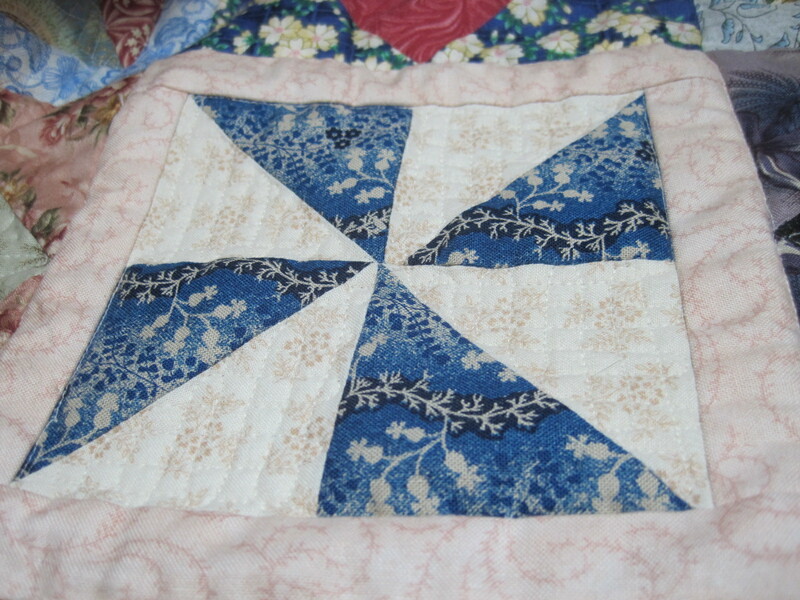 It took a little figuring to figure out how to make this binding, but in the end, I am so happy with this little quilt. It will be the quilt I cuddle under all winter. The next fun project I let myself work on was a little table runner out of those darn Christmas fabrics that I can’t resist buying! I’ll be back later to share that with you. 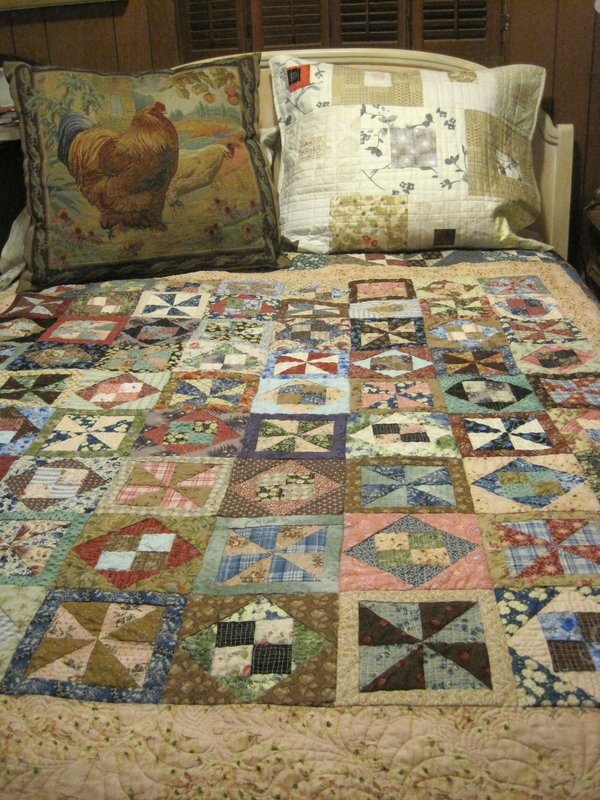 I finished this big quilt before I took my trip. 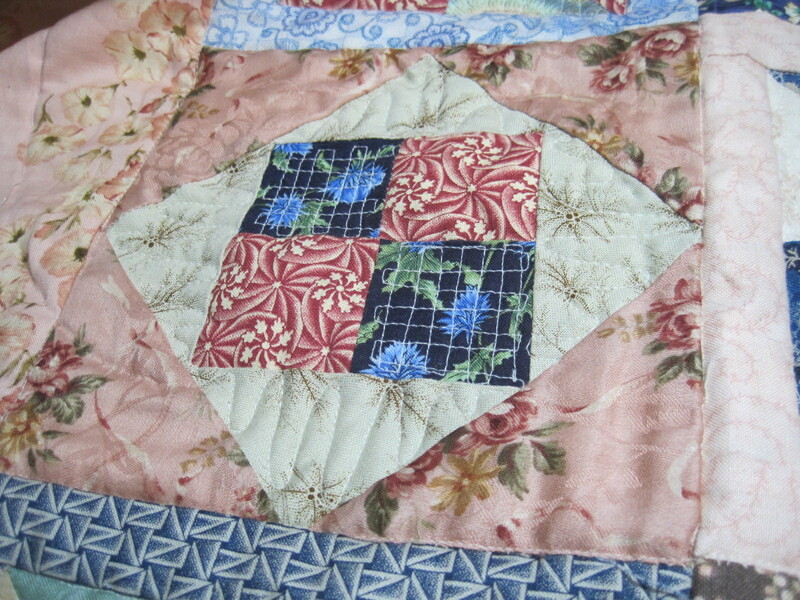 I showed some close-ups of the quilting in a previous blog post (here,) and here is a picture of the finished quilt. I have been enjoying it on my bed. The colors are quiet and peaceful. 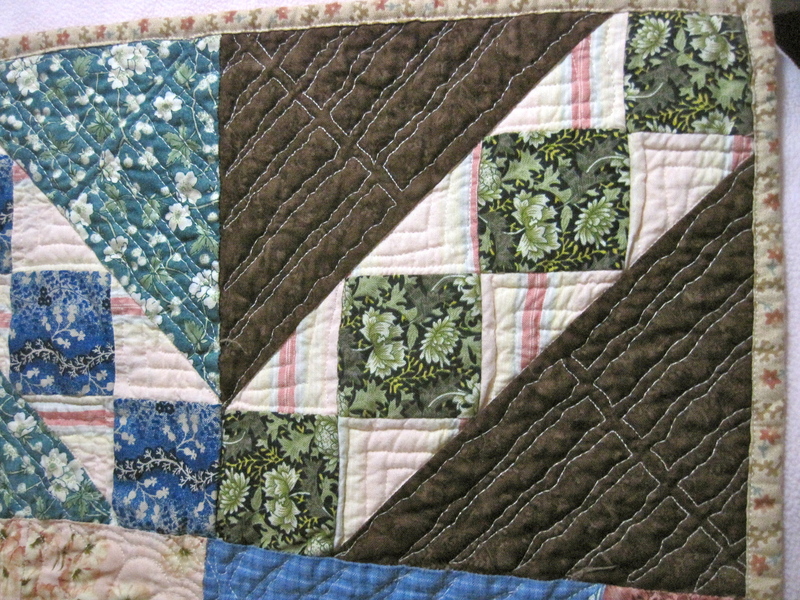 Here is the little quilting design I made up for the large triangles on the border. I like it a lot. 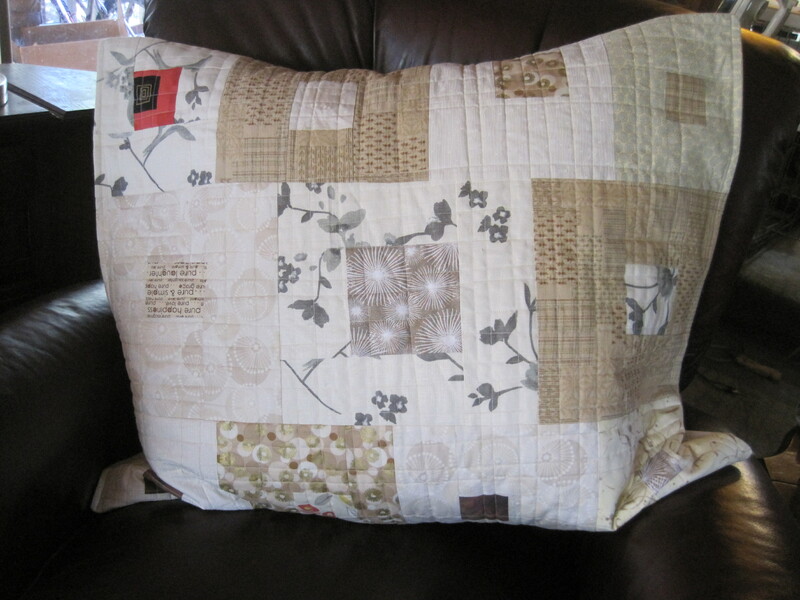 Oh, and here is a picture of a pillow cover I made for an oversized pillow. I discovered that I sleep a lot better with one of these big pillows! So I bought one at Home Goods, and decided to make a cover for it. I used some blocks that I had been experimenting with. I love how it turned out. That’s all for now. I have been having some great creative days since coming home. I’ll share more later! 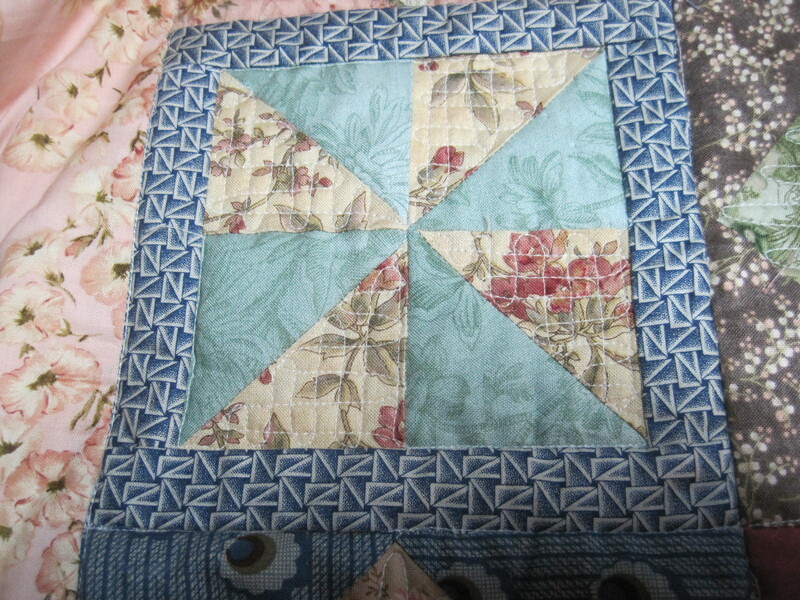 The other day I was looking for an empty plastic tub and I came across some quilt tops that I LOVED when I completed them. One of them was already basted into a quilt sandwich. 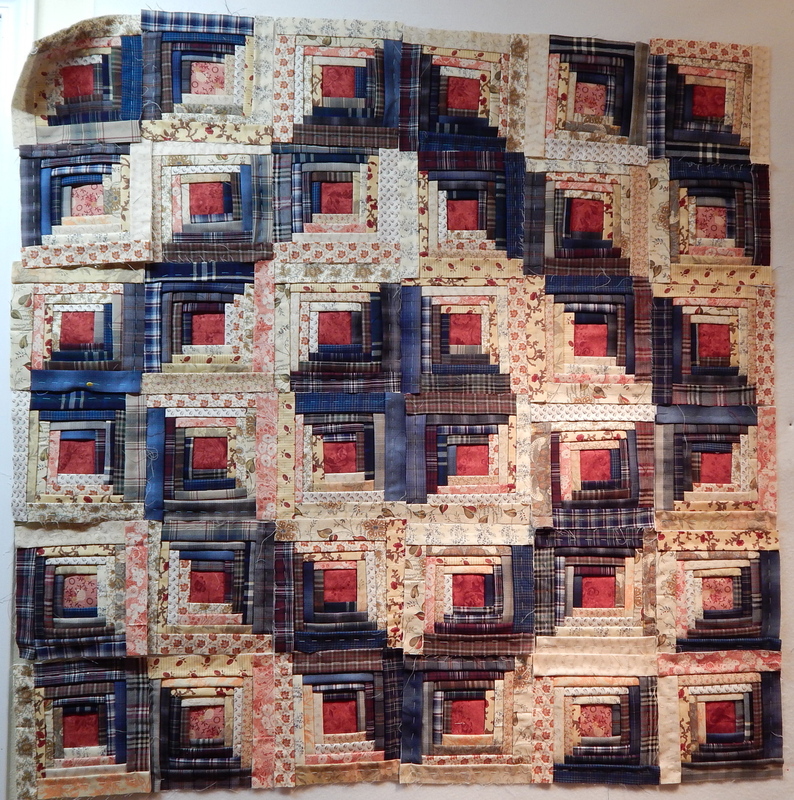 So I am in the quilting and finishing mode lately. 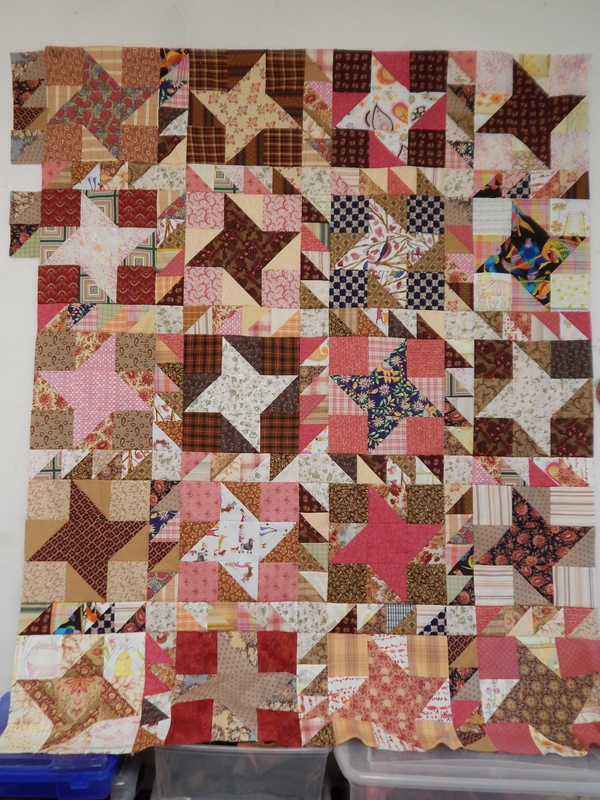 Here are some of the squares from the big one I’ve been working on. I have the center complete now, and still have 2 borders to get done. 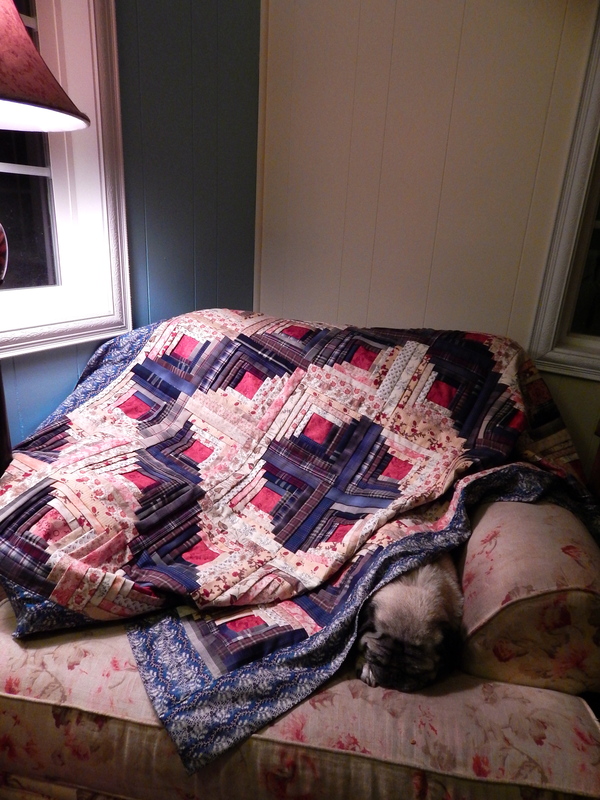 I’ll show you the whole quilt as soon as I finish it! 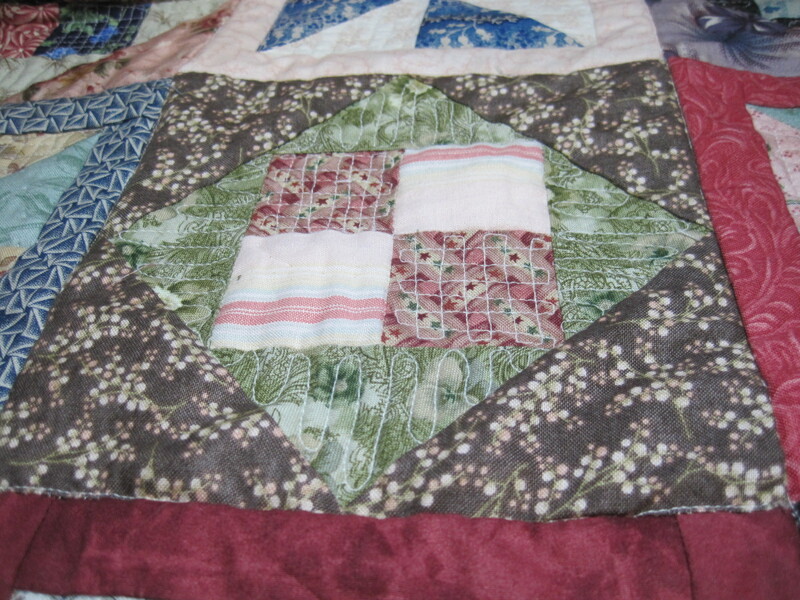 This was another quilt that I loved the process of making. 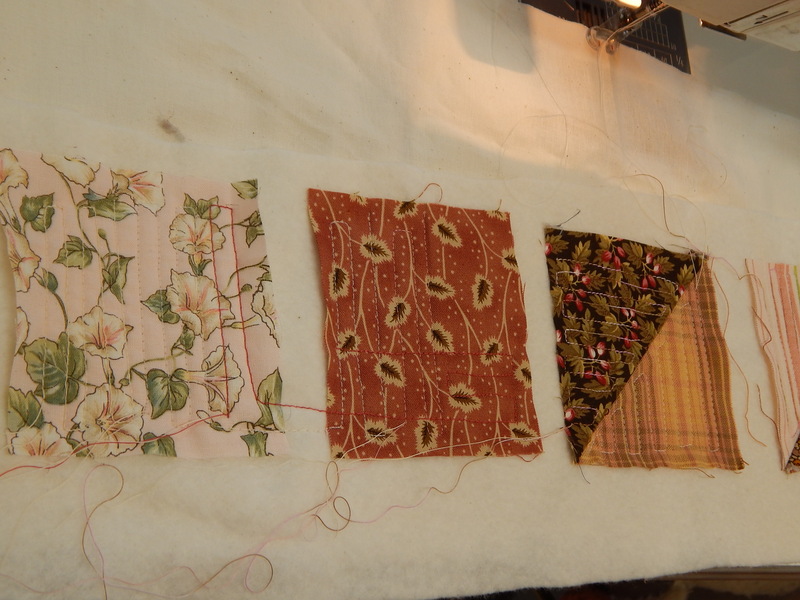 I had all my favorite reproduction fabrics and a lot of ‘fancy’ fabrics pre-cut into the shapes that I needed. And then I would sit and put together each square JUST SO. Choosing the colors is one of my favorite parts of quilting. I’m including this picture as a reminder to myself. And maybe to solve a mystery to someone else. 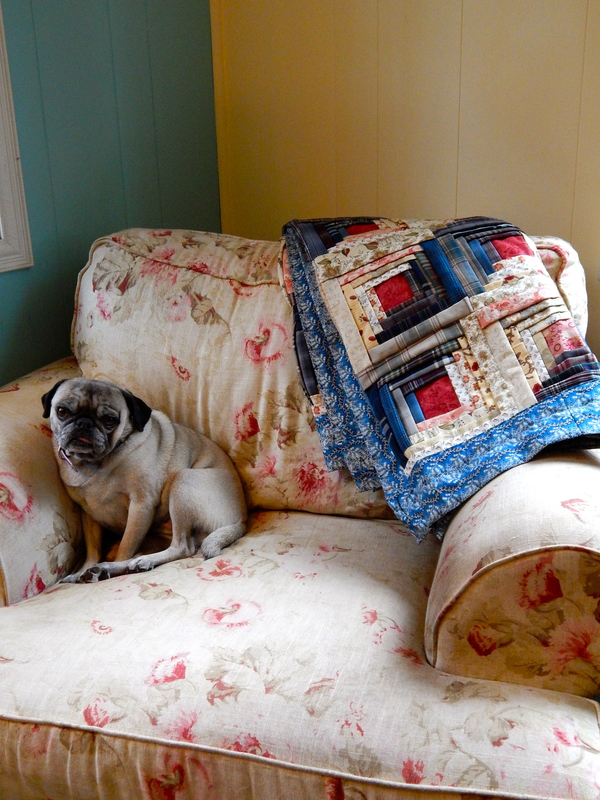 Sometimes when I am quilting/sewing a lot, my sewing machine will start to squeak. It squeaks with each stitch. So I know it is one of those moving parts. The sewing machine repair guy showed me how to take the top off my machine and oil the moving parts. So I do that. Nope. Still squeaking. I take the front off, and try to find parts to oil in there. Nope. STILL SQUEAKING. So finally I take the bobbin out and oil in there, even though I know that’s probably not it. So exasperating. So then I sew a little bit and just STARE at it. And I finally remember. It is this part that squeaks. 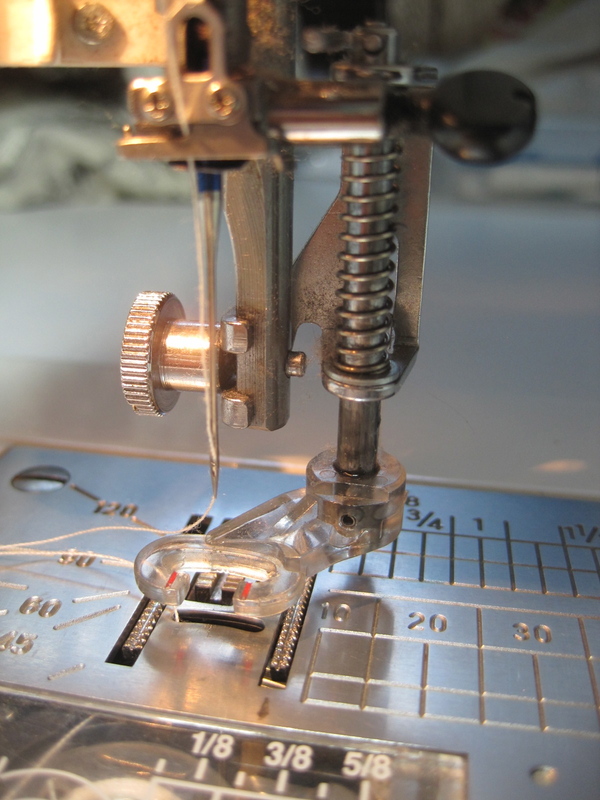 Just the little shaft on the quilting foot with the spring thingy on it. Ahhh, peaceful silent sewing at last. It probably was a good thing that I oiled all those other parts anyway! 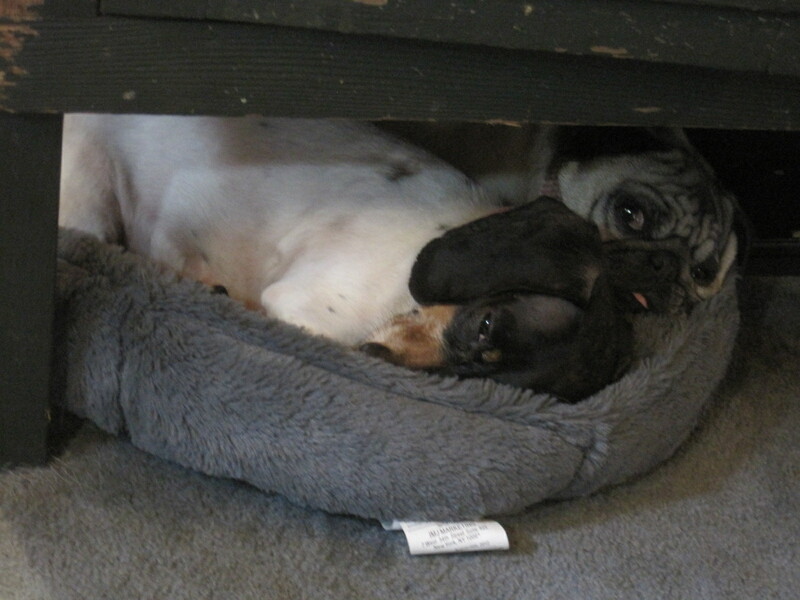 And lastly, a shot of the girls coexisting peacefully. These two can have some pretty intense “arguments.” But when it comes to comfort, they are birds of a feather.